Ken and Sarah Ramsey's Keystoneforvictory, ridden by Julien Leparoux, ran down local favorite The Pizza Man in deep stretch to win Saturday's G3 Stars and Stripes Stakes at Arlington Park by 1 1/2 lengths. Bet down to 9-5 off a 5-1 morning line, Keystoneforvictory covered 1 1/2 miles on the firm Arlington turn in 2:29.89. Applicator rallied to get third, just ahead of One Go All Go in the field of nine older runners. Keystoneforvictory, a 4-year-old colt by the Theatrical stallion Shakespeare out of Free Fee Lady, by Victory Gallop, was winning for the eighth time in 15 career starts. He is trained by Mike Maker. Belomar, a 23-1 long shot, raced off to a wide early lead, setting fractions of :25.24, :49.80, 1:15.15 and 1:38.93 for the opening mile. One Go All Go was in closest pursuit throughout, about nine lengths behind the leader, with Mongol G racing in third and The Pizza Man in fourth. Leparoux settled Keystoneforvictory into sixth position, then moved the winner just to the outside of The Pizza Man and jockey Florest Geroux as the field rounded into the stretch and Belomar's lead quickly evaporated. Time for the opening 1 1/4 miles was 2:05.32. The Pizza Man, contesting the Stars and Stripes for the fifth consecutive year and having won it twice, looked for a moment to be en route to another victory, but Keystoneforvictory collared him in the final furlong and pulled away for the win. Coming off a May 29 allowance victory at Gulfstream Park at 1 1/2 miles, the Stars and Stripes was Keystoneforvictory's first graded stakes win. “He's a pretty easy horse to train. He's a win machine,” said Maker. 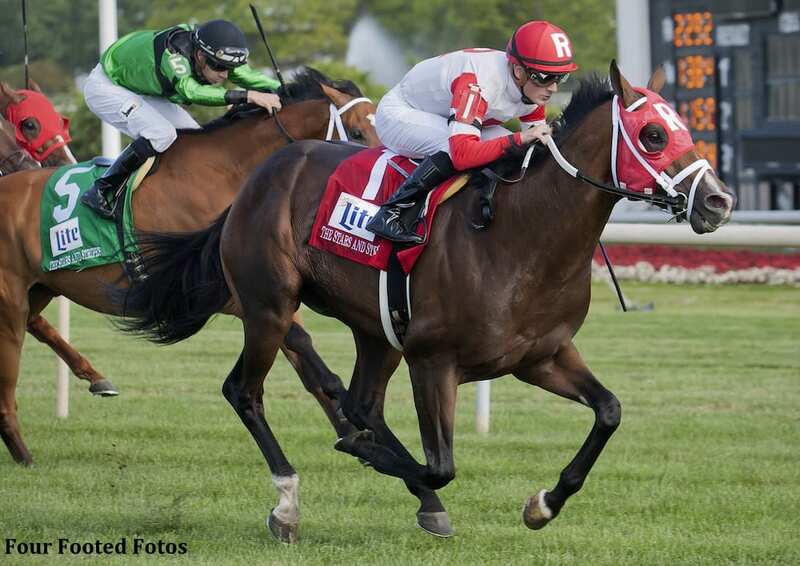 This entry was posted in NL List, Racing and tagged Arlington Park, julien leparoux, ken and sarah ramsey, keystoneforvictory, mike maker, Stars and Stripes, the pizza man by Paulick Report Staff. Bookmark the permalink.